"THE THUNDER GAMES: In The Future of Climate Change"
It is 1000 years in the future, and the world suffered the consequence of lack of action by humanity towards the climatic change, until only three centuries ago. It was only then that humankind finally came together to take drastic measures to reverse the climatic change by promoting plant life like never before to lower the levels of carbon dioxide accumulated over the centuries. This included returning wilderness everywhere to its original wild state to serve as carbon dioxide sinks. Riia Greenthistle is a 17 year old living with her family in rural northeastern Namerica, next to the wilderness reserve covering the northeast mountain ranges. She happened to get to know the wilderness well, and become a hunter to bring meat to her family's dinner table. But on an exploratory trip into this wilderness with her brother she comes upon a great festival of the descendants of Native peoples, known now as Indnat peoples (combining the words 'Indian' and 'Native') It is designed for youth to test traditional wilderness skills and arts,. 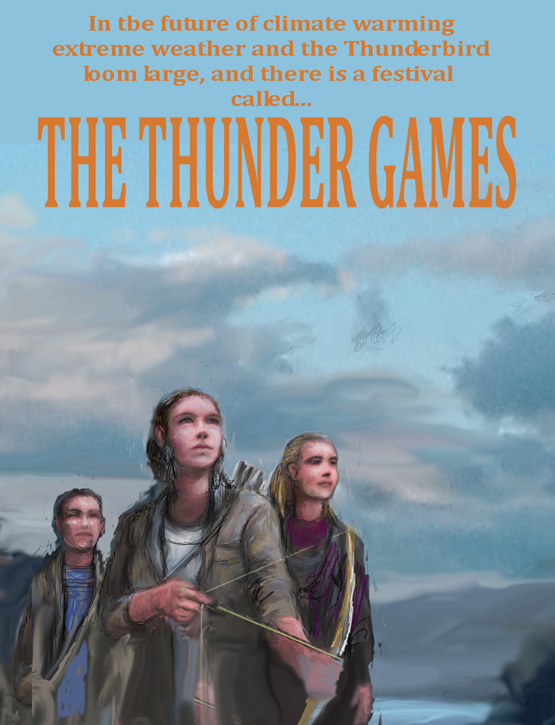 It is a competition between young people.called the Thunder Games, in honour of the Thunderbird, the omni-present symbol for the extreme weather of the world that was the consequence of climatic warming. All creative work by A. Paabo has automatic author-artist copyright. If no charge is applied here to read it, it is temporary to promote the project. A.Paabo, Box 478, Apsley, Ont., Canada - comments and inquiries welcome. Revision 2015 (c) A. Pääbo.